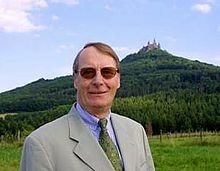 Prince Michael of Prussia (22 March 1940 – 3 April 2014) was a member of the Hohenzollern dynasty which ruled Germany until the end of World War I. His great-grandfather William II was the German Emperor and King of Prussia until 1918. Although "Kaiser Wilhelm" died in exile and his family was stripped of much of its wealth and recognition of its rank and titles by the German Republic, he spent nearly all of his life in Germany. Prince Michael was the second son of Louis Ferdinand, Prince of Prussia, and Grand Duchess Kira Kirillovna of Russia. Both of his parents lived their early years as members of ruling Imperial families that were deposed before they reached adulthood, leaving them to adjust to life in straitened circumstances, in exile or under surveillance, and sometimes in flight from their ancestral nations. Although the Kaiser lived in the Netherlands under banishment from Germany when Michael was born, by the time he was ten years old both his great-grandfather and grandfather had died, leaving his father as the Hohenzollern pater familias whom German monarchists recognized as their rightful emperor and king. Michael was born in Berlin, but grew up in Bremen. He studied in Freiburg and worked later for several multinational corporations. He also wrote several history books. Having made the decision to contract a non-dynastic marriage, he submitted to his father, then head of the family, a renunciation on behalf of himself and his future descendants to the family's claim to the defunct thrones of Imperial Germany and Royal Prussia, executed at Bremen on 29 August 1966. On 23 September 1966, he married in Düsseldorf Roman Catholic commoner Jutta Jörn (born in Gießen, 27 January 1943), an administrative assistant. The couple had two daughters together prior to divorcing on 18 March 1982. On 23 June 1982, he married secondly in Bad Soden am Taunus, again non-dynastically, to Roman Catholic commoner Brigitte Dallwitz-Wegner (born in Kitzbühel, Austria, 17 September 1939 - 14 October 2016), granddaughter of German aeronautical engineer Richard Wegner von Dallwitz (1873-1945), also known as Richard von Dallwitz-Wegner. The couple had no children. Along with his elder brother, Michael eventually repudiated the implications of his renunciation claiming, in a lawsuit against his nephew Georg Friedrich, Prince of Prussia, that the forfeiture of an equal share with his siblings in the family's remaining fortune, the bulk of which had been placed in a trust for William II's heir, was discriminatory. Michael was the godfather of Georg Friedrich, Prince of Prussia. He died on 3 April 2014, aged 74. Two years later, his wife Brigitte also died, after committing suicide. ^ a b c Genealogisches Handbuch des Adels, Fürstliche Häuser XIV. "Haus Preußen". C.A. Starke Verlag, 1991, pp. 123, 133-134, 145-146. (German). ISBN 978-3-7980-0843-4. ^ Bibliography of Aeronautics. 329, Dallwitz, R. Wegner von. Die beste Tragdeckform und der Luftwiderstand. Rostock i. M., C. J. Volckmami, E. Nachfolger (Ewette), 1910, pp. 1-72, ill. Noted in: Wien. ^ Wielen, Roland und Wielen, Ute, August Kopff, the Theory of Relativity, and Two Letters from Albert Einstein to Kopff, The Archives of the Astronomisches Rechen-Institut, Heidelberg 2013, p. 181 (German). ^ Welt. Oswald, Andreas. Der Taggespiegel Adelshochzeit in Potsdam: Wenn das der Kaiser wüsste. 26 August 2011. retrieved 11 May 2016. Wikimedia Commons has media related to Prince Michael of Prussia. This page was last edited on 3 January 2019, at 18:22 (UTC).